In this guest post Sarah Riley, from Inspired Camping, is encouraging you to think outside the box and see how camping could make you a better blogger. Intrigued? 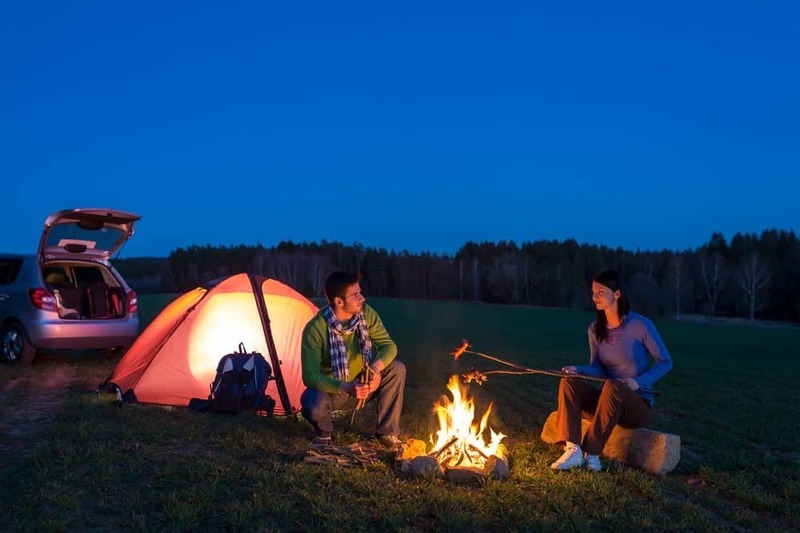 Then read on…..
Everyone loves camping for different reasons. Some set off with just backpacks and hiking boots, while others pack their best crockery and patio furniture. For my family it’s somewhere in between and it wasn’t until I set up Inspired Camping that I realised how my experiences as a camper could also help me become a better and more fulfilled writer and blogger. Camping can be a roller coaster of emotions at times. All campers have at some time battled through storms that tore down tents and scared everyone stupid. This isn’t far off what happens in the blog world occasionally too. Someone may have mentioned an acquaintance in too much detail so they’ve recognised themselves and are mighty unhappy about it. They may even have promised something they can’t deliver… like a deadline that can’t be met. But whatever it is bloggers must always remember that storms pass and life moves on. Sometimes it’s best to take shelter somewhere safe and come out when things are calmer. I try to share stories about the unforgettable as often as I can… such as when we saw that meteor shower, the time we went skinny-dipping in a mountain stream, the glowworms and fireflies at midnight and all those amazing sunsets. Everyone loves a story and storytelling is a great tool to use when trying to jump from just being a blog to becoming something that someone can relate to. This can also help to attract a loyal audience that will keep coming back for more. When we go camping we do our very best to make our lives easier. We make checklists, we get everyone involved, we try not to pack the unnecessary, we buy the best kit, we organise, and we pick great locations. But when we arrive at our destination we often forget to deal with the simple things and that can make life very difficult. For instance, unless the kids are fed and entertained they’re going to make the experience of pitching the tent a nightmare. The same can be said of the blogosphere. It’s important to look after the simple things and tell your audience what food and entertainment they should expect, or they might simply run off somewhere else. Making it clear why someone might want to visit again and how you will work hard to make everything unique, entertaining and inspiring is in my opinion essential. So you see blogging and camping aren’t so different after all! But if I haven’t convinced you then don’t worry… I won’t be upset. All I ask is when you’re looking after those simple things and telling stories about how bad the storm was, always make sure you take time out occasionally to smell the fresh air and see how bright the stars are. Sarah Riley is Creator and Writer of Inspired Camping, a free Cool Camping Magazine and lifestyle resource for the busy camper that helps inspire family adventures outdoors, by bringing high quality, cool, retro, vintage, funky and eco-friendly inspirations and news together in one place. She is also the author of Beach Potato , a summer and surf adventure novel for kids. Great post. I am a budding writer too who loves camping and I love the comparison that you have made between the two. I intend to pit your suggestions to use in my future blogging expeditions. Agreed with your fact that camping and blogging are quite same somehow. I love to go on camping and hiking tours as it will cherish my body and mind with extra energy, new thoughts and lots of positiveness. We learn to face challenges and dealing with problems , in such tours and I believe that willingness to take adventures in life,can only make it joyful and happier.